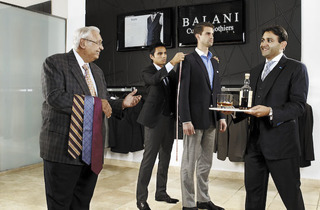 Chicago father-and-son custom clothing company, Balani, celebrates 50 years in business. Sonny Balani, owner: I got involved [with the business] eight years ago. I have an investment banking/trading background. I grew up around the business and had no intention in going into this at all. I think my dad asked me once when I was 16, and I just said “No way.” And he just kind of dropped it. And then around 2003, I came around and saw a potential here. But I really wanted to make it a place where I would want to shop. I wanted to bring a little more hospitality into it. A lot of times people think about custom clothing, and they think of it as stodgy and stuffy. We’re the opposite of that. Sonny Balani, owner: Most of our clients are type-A-ish. They dress well and put a pretty high value on their appearance. Everything from the banker guy to a younger guy who likes a slimmer fit. We have full bars [in each room], so you can kick back and have a Scotch after work...Once we made a custom Halloween suit for a guy who wanted an exact replica of the Joker suit. We also do a lot of weddings and a lot of engagements. A lot of brides are buying the experience for grooms. Ricardo Bucio, manager: The inside of our jackets is really cool. Most tailors won’t offer you a lot of choices in linings, but we do. And there aren’t any extra fees for the additional perks. That way, you don’t have to keep calculating what the cost is going to be, and you can really enjoy the experience. On the pants—most people love this part—is a grip guard, so your shirt doesn’t become untucked. Over the years, Mr. [Peter] Balani (pictured, far left) has added different details to make the clothing more durable. The front of the shop also offers ties, cuff links and socks to complete the look. Suits start at $795. Visit Balani Clothiers at 55 W Monroe St (312-263-9003) and 10 S LaSalle St (312-345-1535).